There’s really only 3 ingredients needed for this peach cobbler plus a little cinnamon sugar for good measure. Drain one of the cans of peaches, reserving the syrup. Empty the peaches into a 13x9 baking pan. Empty the entire contents of the other can of peaches (with syrup) into the 13x9 pan. Spread the peaches out evenly. Sprinkle cinnamon sugar across the top of the peaches. Sprinkle the cake mix on top of the peaches and press down with your hands. Cut butter into 16 pieces and distribute across the top of the cake mix. Pour reserved syrup over the cake mix and run a knife through the mix and the syrup to spread it around a bit. Bake in preheated oven for 45 minutes. Serve warm with ice cream, fresh cream or milk. 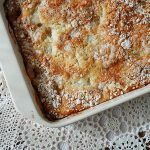 This recipe for 3 Ingredient French Vanilla Peach Cobbler was printed from AmandasCookin.com - https://amandascookin.com/3-ingredient-french-vanilla-peach-cobbler/ and can only be printed for education or personal use.